Belmont ace Nate Espelin is looking to build off a strong 2017 campaign. Suite Sports is ready to unveil its Preseason MIAA Baseball All-State Team as selected by our team of contributors and editors. As the season unfolds, we will release our Midseason All-State Team, before releasing our 2018 All-State Team at season's end. 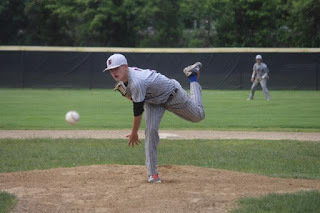 Vasil is widely considered the top Major League Draft prospect in the region and is coming off a junior season where he went 9-0 with a 0.51 ERA over 69.1 innings. The Raiders ace and Michigan commit heads into this season as one of the hardest throwers around. Hajjar is coming off a season in which he struck out 69 batters in 38.1 innings. One season after helping to lead St John’s to a Super Eight title, Burke is back atop the Pioneers’ rotation. The left-hander led Wellesley on a run to the Div. 1 state champion in 2017 pitching to the tune of a 1.93 ERA. Now, the Virginia Tech commit will try to help the Raiders achieve far bigger goals. As the Marauders look to repeat their success of a season ago, Espelin will be counted on to repeat his 2017 All-State performance. Noviello went 6-2 with a 1.51 ERA and 62 strikeouts in 2017, and the Fairfield commit has the talents to have an even better senior campaign. McDonald came up key in the Pioneers' Super Eight run last June and will be counted on to be a solid number two behind Burke in St. John's Shrewsbury's 2018 rotation.